Last week, CBS All Access wrapped up the first half of Star Trek Discovery Season 1, with the show taking a brief hiatus before the second half of the season resumes on Sunday, January 7 at 8:30 PM ET. 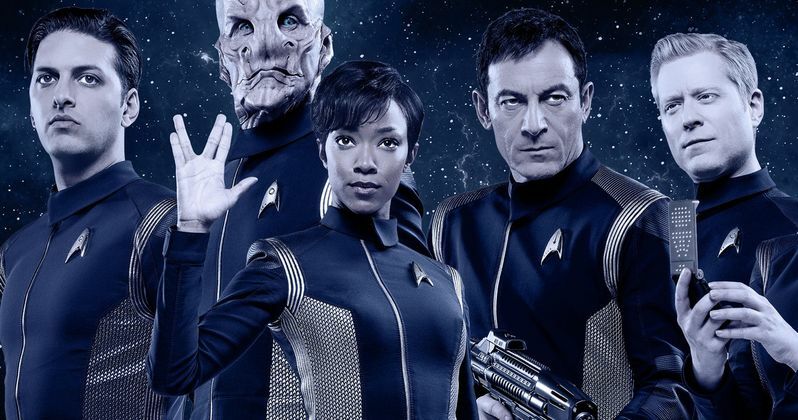 CBS All Access has already renewed Star Trek Discovery for a second season, and while we still have six episodes to go before the first season closes out, many are wondering how some of the bigger questions regarding continuity will be resolved, since it has been confirmed that the show is set 10 years before the original Star Trek series. Executive producer Aaron Harberts, who serves as a co-showrunner alongside Gretchen Berg, revealed they plan on tackling these continuity issues as they prepare for Season 2. There will be SPOILERS for the first 9 episodes of Star Trek Discovery below, so read on at your own risk. The first nine episodes have revealed some rather surprising details, including the bombshell that Sonequa Martin-Green's Lt. Michael Burnham is actually the adopted sister of the iconic Vulcan Spock (Leonard Nimoy), despite never being mentioned in any of the Star Trek movies or TV shows before. There is also the controversial "spore drive" which powers the USS Discovery, which, when paired with Burnham's lineage, has some fans thinking the show is abandoning the canon set forth in the original series. Aaron Harberts revealed to fans that he is definitely taking their concerns to heart and that they are working on explanations for these supposed diversions from the Star Trek canon. Here's what he had to say below. "We have ten years until the original series comes into play. It is a challenge creatively because we have lots of choices, in terms of how do we reconcile this [Spore] drive? This surrogate daughter of Sarek? How do we reconcile these things the closer we get to the original series? That's going to be a big discussion that we have in season two. What's so fun about the character of Michael, just because she hasn't been spoken about, doesn't mean she didn't exist. A lot of the writers on our show are deeply involved in Star Trek, their knowledge is some of the finest around, they really do help us find areas where we can steer around things. But the Spore drive? Who knows. It could be classified. There are many options. Some of the best ideas come from all over the place, not just in our writers room so I love hearing about the fan ideas and theories. We'll have to see." Shortly after the series debuted in September, Sonequa Martin-Green hinted that a young Spock may appear on the series, but that has still yet to be confirmed. The series was created by Bryan Fuller, but, due to his heavy involvement in Starz' American Gods, which he also created, based on the Neil Gaiman book, Fuller backed away from the show, leading to Aaron Harberts and Gretchen J. Berg stepping in as showrunners. While Harberts didn't come up with the concept to set the series 10 years before the original series, he revealed that he doesn't exactly know why Bryan Fuller came up with the idea for that specific setting, but he's definitely grateful. "I'm glad that it is because it set up parameters for us. Let's say we set it 100 years after Voyager, the canvas is so broad. To try to contemplate, you're creating a whole new mythology really. I think Bryan [Fuller] was interested in the original series and I think he was interested in the lead up to where the original series is. I think he was very interested in the Klingon federation conflict, but I don't know definitively why he picked that." Sonequa Martin Green also shed some light on one of the season's most popular episodes, where the USS Discovery team gets caught in a Groundhog Day type of time loop by Harry Mudd (Rainn Wilson), stating that episode was a "unique experience," while commending director David Barrett because the production was "quite harried." She did add how amusing it was that they kept finding themselves back at the party scene. This report from Metro doesn't have any details about the back half of Season 1, but hopefully we'll have more details soon.